Most people don’t know the most important service a bed frame provides. A bed frame raises the mattress off the ground to dry out all the sweat you eject into your mattress each night. If this moisture builds up too much over time your mattress can turn into a perfect new world for colonies of mold and mildew. But like most things, bed frames are overpriced. I once saw a solid wood bed frame for over $1000! If you want a bed frame for less than 40$ with the added bonus of having more storage space then you’ll ever need, build it with 5 gallon buckets! Five Gallon correspondent Robert W built his bright orange bed frame years ago to support his full-size mattress. When he remembers to make his bed in the morning, the buckets are completely hidden from view. Almost. And these buckets are more than just a pretty face. Some people stuff their mattresses with cash, but Robert’s got enough room down there for his entire winter wardrobe. In my experience, a 5 gallon bucket stack should never tower over 15 high. So I’ve invented a term for this amount of buckets which I call a bucketer’s dozen. 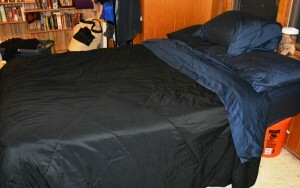 If bakers can invent a new dozen, so can I.
Robert’s DIY bed frame for his full-sized bed is a perfect 3×5, or 1 bucketer’s dozen. A queen sized bed should need 2 bucketer’s dozen, or 30 buckets total. I’m not over-complicating things am I? 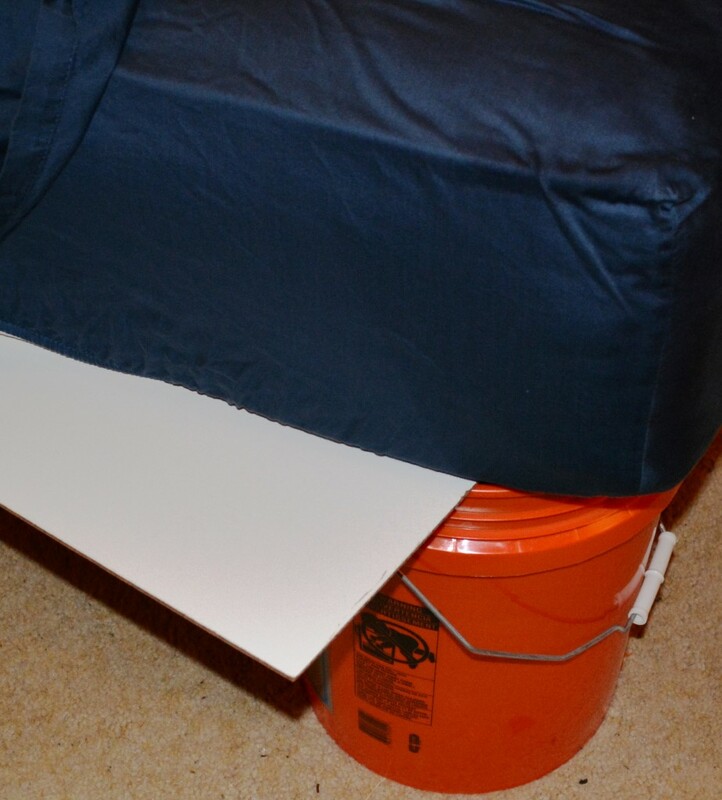 Robert’s offered a few tips for you if you’re building a bucket bed frame of your own. He’s done this for years so he’s already fallen down all the pitfalls. 1. Don’t give your buckets away! These are load bearing buckets. Robert’s a nice guy, so over the years he’s been generously sharing his mattress buckets with family and friends. With each bucket donation his mattress became saggier and saggier. Fortunately he was able to fix this with a quick trip to Home Depot. 2. Find a stiff support for between the buckets and the mattress. This evens out the distributed weight of the mattress and should take care of all those bucket nightmares you’ve been having because you sleep better. Thanks again to Robert W for sending in this idea along with the pictures. We’re always looking for more cool 5 gallon bucket uses so if you’ve got a Five Gallon Idea to share, get in touch. This is the stupidest idea I have ever seen in my entire life. super idea thanks for sharing!